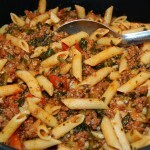 An Italian pasta dish with meat marinara, spinach, onion, and tomatoes, tossed with mozzarella and parmesan cheeses. In a large skillet, over medium high heat, sauté onions and garlic in olive oil, until onions are almost translucent. Add ground beef and sausage, cook until brown and no longer pink. Drain excess fat. Add marinara sauce, tomatoes, basil, oregano, Italian seasoning, red pepper flakes, Worcestershire sauce, crushed beef bouillon cubes and sugar to the skillet. Season with salt and pepper to taste. Cover and simmer for 30 minutes, stirring occasionally. Meanwhile, cook the pasta until al dente, according to package directions. Drain well and set aside. 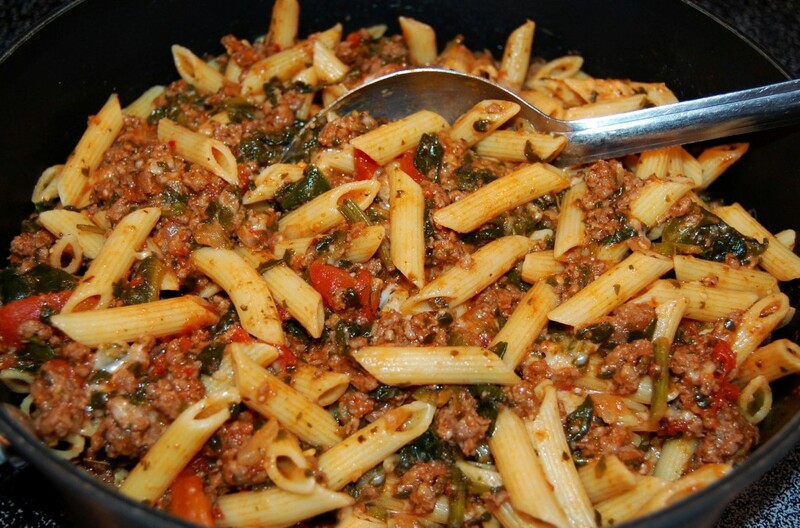 Stir in fresh or cooked spinach leaves to the meat sauce. Add cooked pasta, parmesan and mozzarella stir to combine. Serve in pasta bowls topped with more parmesan cheese.